The In Crowd Average 0.00/5 - out of 0 total votes. As Tidepool begins his epic destruction of the United States, a group of young heroes takes the scene by storm — with their cameramen in place to get their good sides on film! 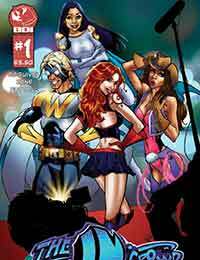 From the pages of Critter, The In Crowd mixes the fun of superheroes with the ridiculousness of the reality TV craze. They’ve got great hair, great bodies, and great power. But great responsibility? Not so much!